There are no hummingbirds in Tzintzuntzan today. The few trees and the grass-covered fields make it hard to imagine what it was that had attracted these tiny birds when, six hundred years ago, the Pur pechan founders first surveyed the area. Understanding why a gathering spot for hummingbirds should make it so special is not much easier, especially to one accustomed to religions of the one-god "western" type. It's especially difficult to relate the tiny birds to the the archeological site at Tzintzuntzan. Neither the austere style nor the massive scale of this ceremonial center suggest in the slightest delicate little birds sipping nectar from flowers. Its great platform, measuring 425 by 250 meters, would hold thirty soccer fields. On it's west side, combining the geometries of circles and rectangles to produce the most unusual of mesoamerican building shapes, are pyramidal bases which each held a wooden temple. With their circular bulges facing outward, the remains of these y catas look like stylized eyes with rectangular brows. You feel that the founders placed them because of the view. In Nahuatl, Teotihuacan means 'The City of the Gods', or 'Where Men Become Gods'. The plazas, avenues, and great pyramids of the city of Teotihuacan were laid out as a symbolic sacred landscape of artificial foothills and mountains. The complex of approximately 600 pyramids of various sizes is dominated by the great Pyramid of the Sun which, it was discovered in 1971, was built over a natural cave with four chambers (cf. Sacred Caves). Mesoamerican belief saw caves as gateways to the spiritual world (called Xibalba by the Maya). The cave contained remains of offerings and may have been a focus for shamanistic rituals from a much earlier period. There can be no doubt that the Pyramid of the Sun was deliberately built over the sacred cave. 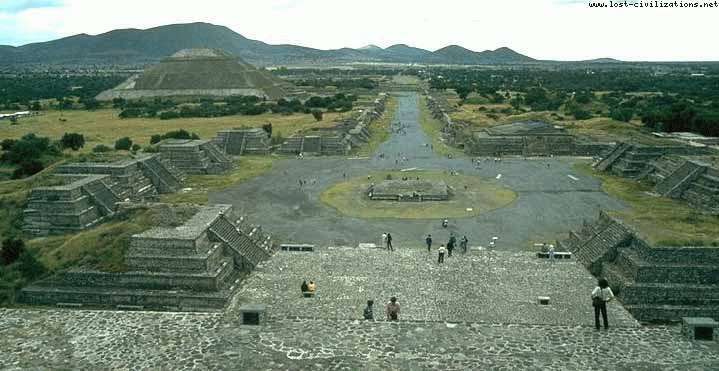 Teotihuacan was probably Mexico's biggest ancient city, with perhaps 200,000 residents at its peak in the 6th century, it was virtually abandoned by the 7th century. Fifteen hundred years ago, Teotihuacan was already known the length and breadth of Mesoamerica. Every traveler to the Valley of Mexico would take time to visit the great city, if only to admire its brightly painted public buildings and stroll down the wide and imposing Street of the Dead that traversed the city's center. Teotihuacan was the largest human settlement in the Americas, with a population of at least 100,000 people. The Mesoamerican world shopped at Teotihuacan, traded with its merchants, and worshipped at its temples. Thousands of scattered villages in the Mexican highlands relied on its markets and specialist manufactures. At certain times of the year, the entire countryside would flock to Teotihuacan's plazas to participate in the annual public ceremonies that ensured the future prosperity of the great city and the people of the Valley. Yet, within a few short centuries, the city had vanished forever. Only a few crumbling pyramids and temples remained as testaments to its former glory. The earliest ceremonial buildings were erected at Teotihuacan about 100 B.C. Within a few centuries, Teotihuacan had mushroomed into a huge city dominated by the great 'Pyramid of the Sun'. This sacred, truncated edifice stood 210 feet high and 650 feet square, a vast pyramid of rubble, adobe mud, and earth all faced with stone. A wooden temple on the summit of the pyramid afforded a spectacular view of the sprawling city below. Between 450 and 650 AD, Teotihuacan reached the height of its cultural splendor and its population is estimated to have between 150,000 and 200,000 people at its maximum. Think of a city in your area with a population of 200,000 and I'm sure you'll be awed as I was by the concept that such a city existed in Mexico more than 1400 years ago. Teotihuacan was the sixth largest city in the world in AD 600. Besides the major ceremonial pyramids, there were also palaces and temples, especially near the north end of the city surrounding the plaza in front of the Pyramid of the Moon. These included the Palace of Quetzalcoatl, the Butterfly Palace, the Temple of the Feathered Conches, and the Palace of the Jaguars. When I saw the Butterfly Palace, with its magnificent stone carvings of birds and butterflies, I wondered if that wasn't an artistic reference to the belief that this was the place that men were turned into gods mentioned in the Aztec song quoted earlier. The sophistication and artistry of the Teotihuacanos can be seen everywhere in the magnificent murals and stone carvings which adorn the walls of the palaces and apartment compounds. The artwork is beautiful, refined, elegant and stylish. Another fascinating feature of some of the pyramidal structures is that they contain a broad, thick layer of mica, which had to be brought from Brazil, over 2000 miles away! If you know anything about mica, it's very flaky and fragile, yet it was brought in very large pieces from great distances (and without wheeled vehicles). Then the mica was used on an inner layer of the pyramid, not where it could be seen. Why? One characteristic of mica is that it is used as an insulator in electronic and electrical things. Was that its purpose here? Another mystery of Teotihuacan. The rest of the city of Teotihuacan consists of residential compounds (ancient apartment complexes) about 200 feet on a side with an sunken, open courtyards at the center bordered by four platforms and rooms or apartments beyond. Often there was a platform or altar in the center of the courtyard. Imagine a Spanish hacienda-style house, with a covered walkway around an open atrium in the center and rooms beyond the walkway. very usefull web site. But you have to write the names of the authors of articles here. we want to use these sources with their names in our own languages . we want to write some articles in our own languages but we have to use the name of the authors and your web site address to show the sources . if you have a book about mythology of mayas and aztecs can you send me pleas as pdf . best regards ADALET Y. 100,000? More like 300,000 conservative estimate. This city was contemporary of Rome and was much bigger. The first socialist state in history complete with government housing and propaganda with the expected imperialist statebuilding through the likes of Siyaj K'ak here and there. Yeah, Mexico rules. i liked it bcoz such type of websites give us strange informations about the changing scenario. omg i love ahren hes got freckles! nice, this will help my meso-american project thx alot guys! love the pictures, but there seems not to be enough to fill the page. DiiZz sHyt goo0 braH wHa yo0 talkiiN bout "wackEd @SS Shyt" tho0 !! Stoop hatHiiN biitcH !!!!!!! . DiiZz sHyt goo braH wHa yo0 talkiiN bout "wackEd @SS Shyt" tho0 !! Stoop hatHiiN biitcH !!!!!!! I thunk the pyramids and the temples are a excellent way for us to learn about other civilazions that were in Mexico, Eygpt,.... long ago.